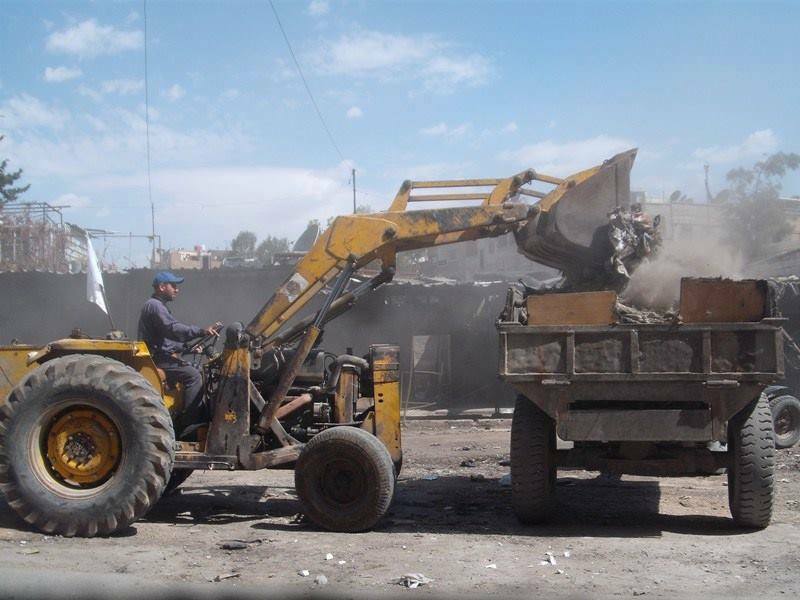 In Yarmouk people are busy cleaning the streets of trash and rubble, Starting from the constant work of the Jafra Foundation in the camp, a dialogue evolves between the protagonists: the trash and a camp scraper. In Arabic, one of the words describing garbage is zubala and it comes from a verb – zabbala – that means to manure, to fertilise. Cleaning the streets of Yarmouk of garbage and rubble activated in my mind an image of what this Arabic root brings with it: zibl, the manure itself. As if those streets received from the gesture of being unburdened a new substance. Something will allow them to grow better in this return to how they were before, even under this siege. And this happens, for me, in the embrace that the scrapers (which made me think of The Crying of the Excavator by Pier Paolo Pasolini, written in 1956) make in their efforts to attend to garbage and rubble to take them away. That poem by the Italian poet Pier Paolo Pasolini entitled “The crying of the excavator” (1956) in the incipit of which these verses seem to give no way out: “Only to love, only to know / counts – not having loved, / not having known. It’s anguishing / to live a consummated / love. The soul stops growing”. This image for me comes now in contact with an opposing, regenerative force, which lies in the way Jafra Foundation constantly renews its efforts in the streets of Yarmouk so that “the soul that stops growing” as mentioned in the poem starts to grow again once it is free from the garbage. To the youth of Jafra and to the new metaphorical fertiliser its efforts are giving to the streets of Yarmouk goes this short dialogue that hopes to be just a soft countermelody to their amazing work and love for the camp. “Jafra Foundation has been working in the cleaning of Yarmouk Camp since the municipality stopped functioning at the beginning of 2013. 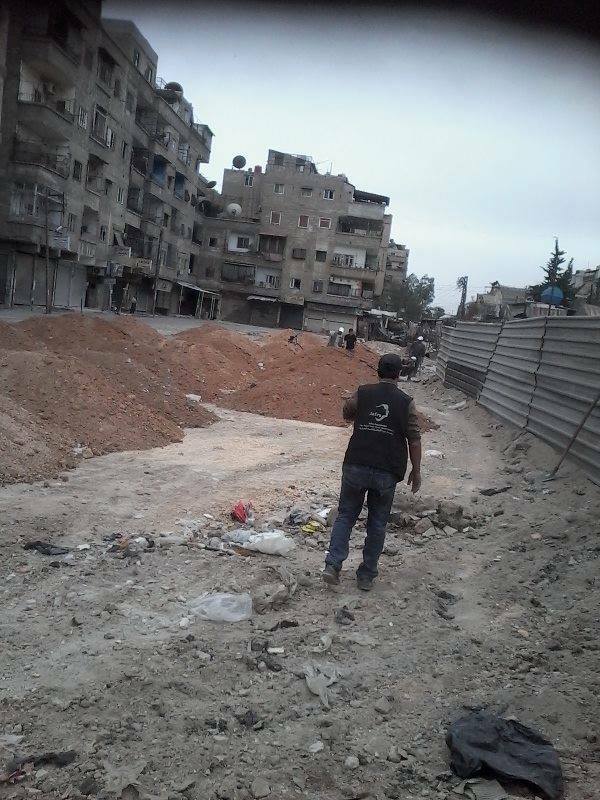 Since that time, the Jafra cleaning team works to clean Yarmouk Camp from the garbage and the rubble that was accumulating in the camp to protect the civilians from all kinds of sickness that they were vulnerable to because of the accumulating garbage in the streets. Jafra will continue working in Yarmouk Camp to help the people there, as we belong to all the vulnerable people in all the streets. the scraper: We must leave now. the garbage: I am ready. the scraper: You will not forget. the scraper: Even after the concrete collapsed. the garbage: It knows all the names of those who hit it. the scraper: And the faces of who will take care of its children. Of the walls that will be built. the garbage: I met the streets. I heard it all. All of it. the scraper: I must take you away. For their sake. the garbage: Because you are the soul transforming weight into space. Your arm that raises me is the last accusation. I am your raised hand, asking for permission to speak. For those who lost this right. the scraper: Taking you away from here is my freedom finding again its way home. the garbage: From the corners of these sidewalks I desired to be a tree and I couldn’t. With heavy branches made of black bags I stretched to the sky, with the wind. Looking for a passage, saying: “I am here”. the scraper: Now that you leave, life will try to come closer to the soil. the garbage: That same life is asking to be heard. And hasn’t got any fear. the scraper: Only those who chase life must be scared of it. the garbage: Because life is still here. You give birth to it pushing me faraway. the scraper: While you are leaving, a trace remains that feeds the seeds. Paths grow up after your departure. the garbage: Wings of light dust. The fine dust becomes light again and doesn’t make people sick anymore. the scraper: With the breath of the streets came back to the surface after a long time holding its breath. the garbage: I was calling you and saw you appear with your youth. the scraper: Through their efforts, through the contagion of ideas, I realized I wouldn’t stay still. That every street was waiting for me and my youth to be there. the garbage: They breed these streets with you. In the struggle of the arms that defeat carelessness. the scraper: The sun will come and sit here, in the place you used to occupy. the garbage: While you’re taking me away, the space starts to offer an opportunity. the scraper: In this embrace of ours the street regenerates. the garbage: The street walked by your youth, the street they will not abandon. the scraper: Whatever happens, they’ll take care of it. In the Milan train station, middle class refugees waiting for the last train.